Wikispace is one of the most easiest wiki I have seen. You can create pages that your family or your fiends will edit, even if they are a little noob with web interfaces. Just sign up in 1 minutes and let’s start ! Nothing to install, start to create it in a few seconds ! 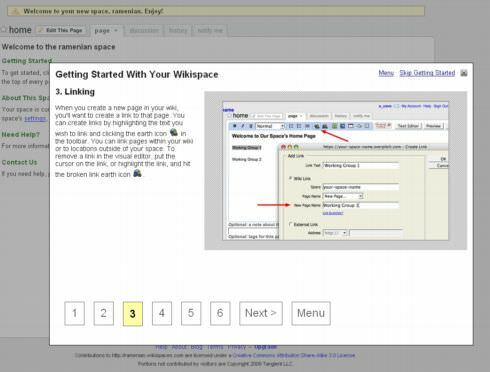 Wikispace is a free wiki but a pricing page is available if you need advance features. However, in my opinion, the basic version is enough to create and interesting wiki. Besides, you can try for free the Plus or the Super version for 30 days (good idea to have a point of view about possibilities of the tool). 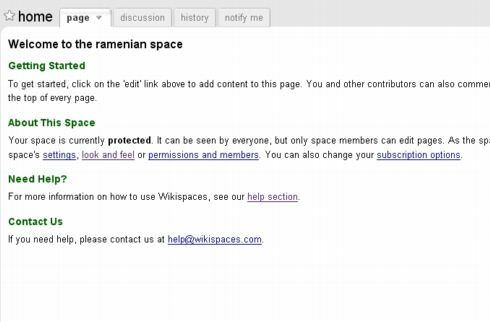 The first thing I really like with Wikispace is its help. If you are a noob with internet community tools, you will be reassured : after registration, just view each steps in a few minutes and you’ll be ready to create and edit pages as you want. After that, home page of your wiki proposes immediatly to personnalize your design easily (choose an other them, upload a logo, change colors) in a few seconds. Don’t hesitate to manage your space, permissions and subscription options too. If you want invite people to join your wiki, just send a mail thanks the dedicated interface. Enter email addresses and text and that’s all ! This is not beautiful but if you need to create easily and quickly a Wiki, I advise to use Wikispace and if you can, the « Plus version » to have more flexibility (only $5/month). Did you test it ? What is your opinion ? Blogs : what kind of fonts do you use ? Why use the Microformats ?